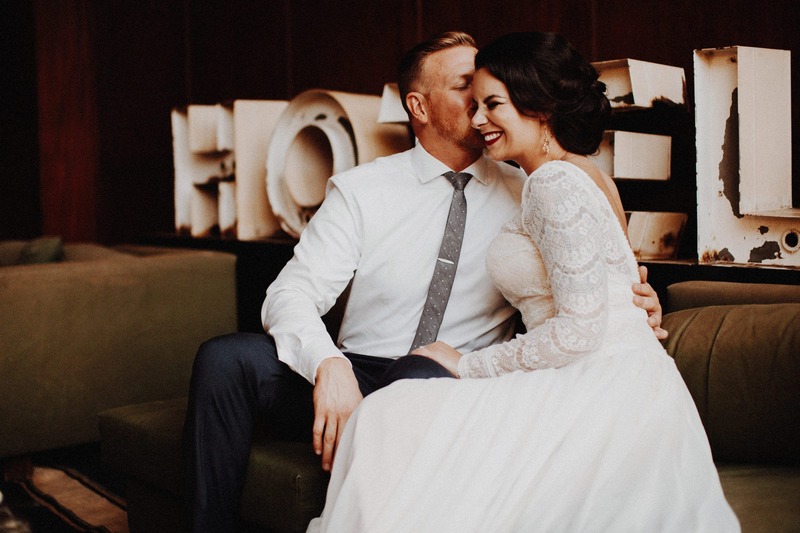 There are hundreds of wedding venues in Portland Oregon and the surrounding areas with a wide range of scenery and price points. It can be tough to cut through the riff-raff and find something that fits your style and checks all of the boxes. We really are lucky to have an abundance of beautiful locations right here in Portland and I’ve curated a list of my favorites for anyone looking for the perfect spot. In the Summer months, Portland is a paradise for anyone who loves the great outdoors. Who needs loads of decorations when you have a light-filled canopy of trees as your backdrop? 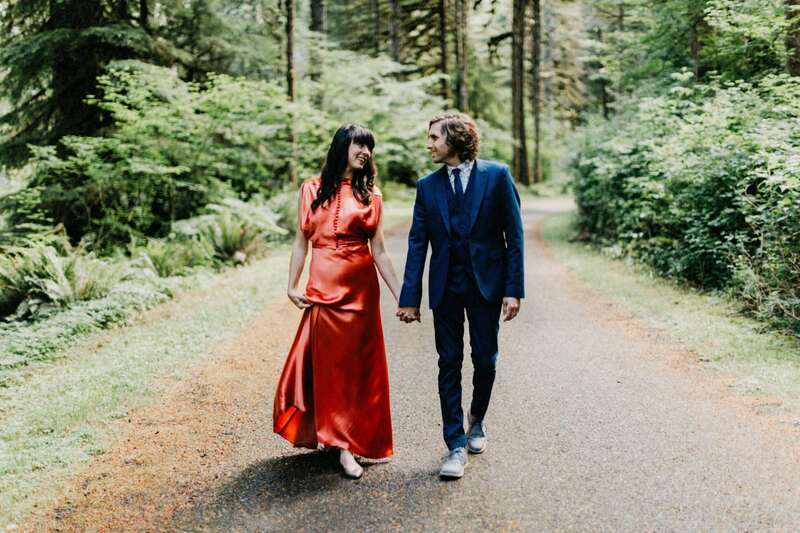 Here are a few of the best outdoor wedding venues in the Portland Area. Nestled in a quiet neighborhood in Southeast Portland is the Leach Botanical Garden. 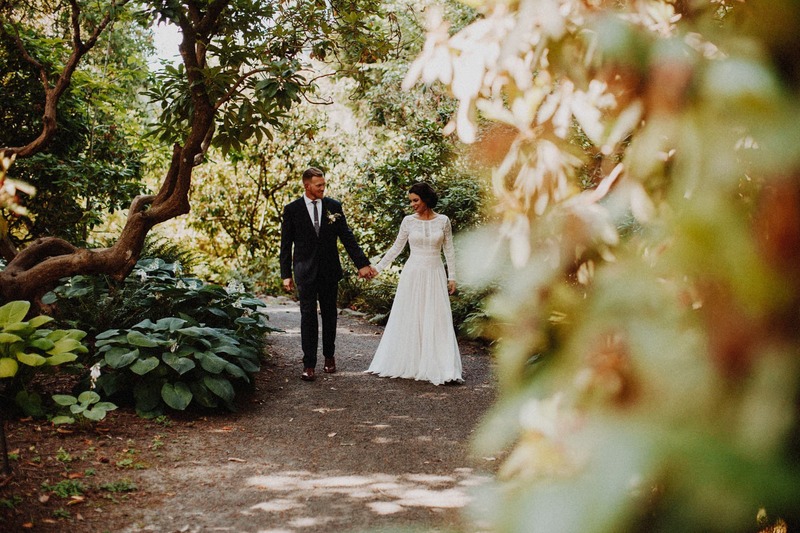 The Historic Manor House is set amongst a woodland forest with, of course, many different varieties of beautiful trees, flowering garden, and lush ferns. The historic white brick structures create a nice clean contrast with the surrounding greenery. This Venue is perfect for a mid-sized wedding of about 80 guests. A short drive from Portland is a quaint logging town that is undergoing a sort of revival. Vernonia is historic, full of charm, and surrounded by a thick forest of pines. Vernonia Springs is a relatively new venue with cabins, yurts, and campgrounds for all of your overnight guests. They also rent bicycles for cruising around on the Banks-Vernonia bike path. Perfect for those who want a mini-break from the city. You can see my recent work from this the Mt. Hood Organic Farm Wedding. This venue is a 200-acre property off of the Mt. Hood scenic Hwy on the eastern slope of the mountain. The venue offers custom farm to table dinners and expansive views that are particularly inspiring at sunset. Mt. Hood Organic Farms is about an hour and a half drive from Portland and 20 minutes south of Hood River. Great for up to 200 guests. A hidden oasis in Southeast Portland, Crystal Springs is a beautiful garden with heaps of (you guessed it) Rhododendron trees. In the months of April, May, and June the flowers are in full bloom. Peaceful ponds and streams flow throughout the grounds creating a zen-like setting within the city. Great for intimate weddings of under 50 guests. 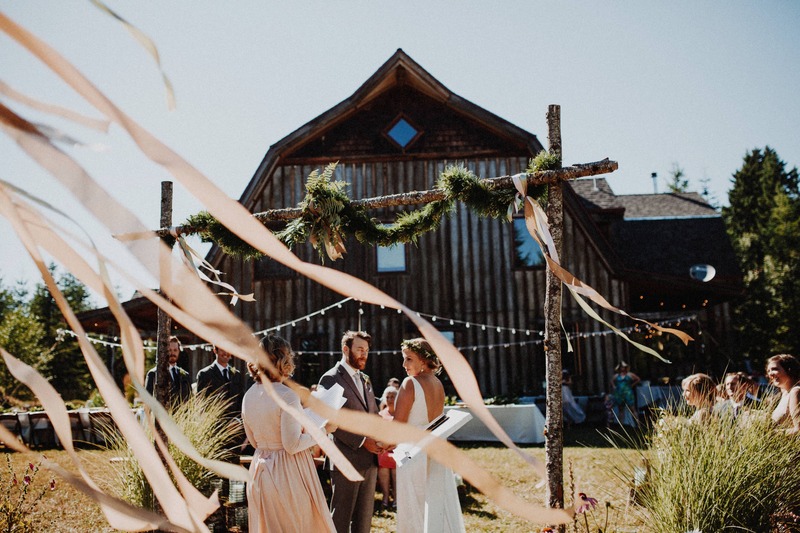 20 miles west of Portland, near the town of North Plains, Horning’s hideout is a huge property with 3 different ceremony locations to choose from. The grounds are a mix of open fields and shady forest groves, allowing for a dynamic mix of scenery. Proximity to Portland makes this venue an easy trip for any guests staying in the city. Great for large and small groups alike. With historic architecture and a very Pacific Northwest garden, Lewis and Clark College is a beautiful venue close to downtown Portland. There is a rectangular concrete pond that reflects sunlight and gives the space a very sophisticated vibe. There is also a beautifully designed indoor reception space in case less than desirable weather strikes. On the Washington side of the Columbia River Gorge, near the town of Washougal, is a quaint Christmas tree farm with a gorgeous reclaimed barn atop a hill overlooking Mt. Hood. Skye Farm is a venue for up to 150 guests. Adjacent homes can be reserved on Airbnb if you need some additional lodging for guests. 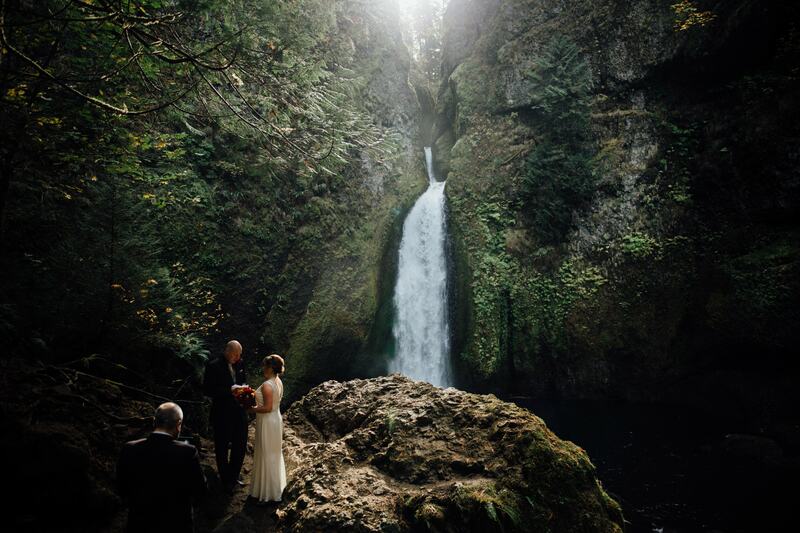 Along the Historic Columbia River Gorge Hwy you’ll find Bridal Veil Lakes. 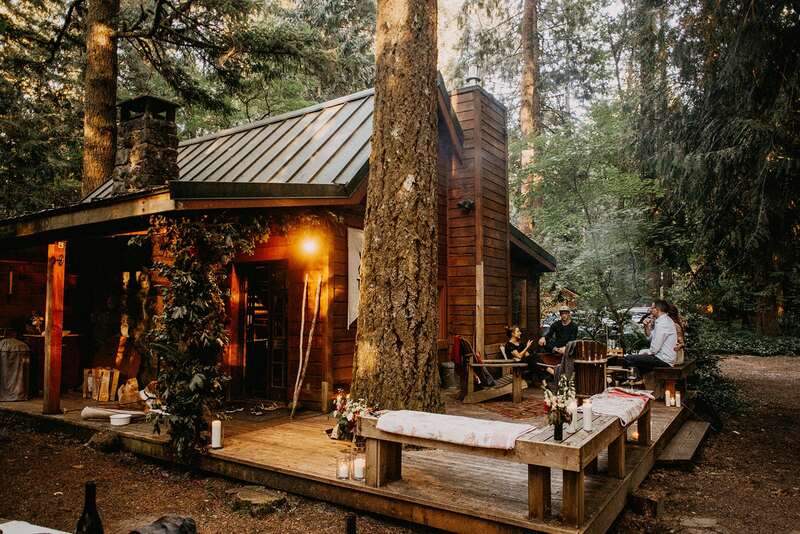 This venue is just 30 minutes outside of Portland, surrounded by old growth forests and spring fed lakes. Guests can paddle around in canoes or just soak up the views on a nice day. Up to 250 guests. Camp Namanu is located outside of Sandy, Oregon near Mt. Hood. The property is huge and there are many ceremony sites to choose from. Historic structures and cabins are scattered throughout the campgrounds. Guests can, of course, camp on site or stay in cabins. There are plenty of activities for guests like a ropes course, archery, hiking, and swimming. Camp Colton is located about 45 minutes southeast of Portland. Another campground with historical structures, beautifully wooded architecture, and lush forests throughout the venue grounds. With indoor and outdoor options this is a great option year-round. Portland is known for unpredictable weather at times and Summer is never long enough. Luckily Portland has some awesome indoor venues that are the farthest thing from boring ballrooms. Unlike most outdoor venues, These indoor spots are all within the city of Portland. Which is super convenient for guests, vendors, and newlyweds alike! Here are just a few of my favorite indoor wedding venues. A clean white space with a bit of historic charm and beautifully worn wood floors is a dream for anyone wanting to put their own personal touch on a space. This place is pretty much a blank canvas that can be styled for any type of wedding. It’s right in the heart of the city next to the Ace Hotel. Huge picture windows open up to the street, but of course, curtains can be drawn for a bit of privacy. A small space for an intimate ceremony or a cozy reception. Clyde Common, one of Portland’s best restaurants, is right next door an ready to cater any event. 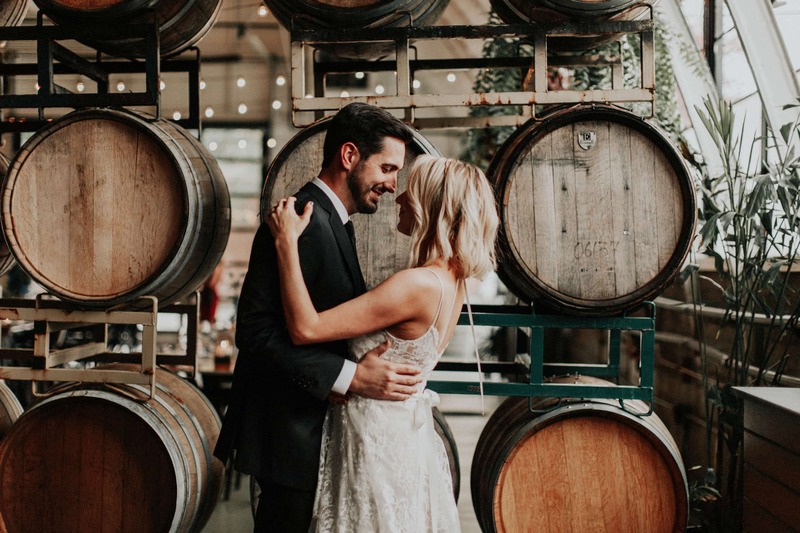 Located in southeast Portland, the Evergreen is a restored warehouse with a capacity of 500 guests. This is an event space so they have everything you could ask for from catering, tables, chairs, lighting, music. A true one stop shop. Plus its full of historic charm and it’s located just across the river from downtown Portland in the industrial SE neighborhood. A very unique venue with lots of room to get creative. Another SE Industrial gem. Cooper’s Hall is a unique wedding venue with a lot of charm and a cozy atmosphere. They have a huge list of wine on tap and a customizable dinner menu. Tin Ranier buckets filled with plants native to the Pacific Northwest hang from the ceilings and barrels of wine are stacked up to create dividers between rooms. There is also a loft area for smaller groups. Just East of the Broadway Bridge is Left Bank Annex. This is a pre-war industrial space of concrete, brick, and timber beams. The high ceilings and wide open space bring endless possibilities when planning a wedding. There are several different spaces including a mezzanine and a basement. These are perfect for getting ready or hiding away and relaxing. Located in Northwest Portland, near the Pearl District, is Castaway. A warehouse originally built in 1929 and restored in 2007. The property also features an outdoor patio and garden space. The high ceilings feature exposed wood beams and the windows are a unique looking sash steel. Think lots of natural light and elements. Yale Union is a center for contemporary art founded by artists. Currently, this building is still going through the renovation process and the event space is up and running. A great way to support local artists and the building is beautiful too. The event space is open and the arched windows let in copious amounts of natural light. Keep it simple or dress it up. Union/Pine is another great space on its own that can be tailored to any style. Featuring high ceilings and beautiful wood floors throughout. Another SE Gem located just across the water from downtown Portland. Revolution Hall is a former High school build in 1906. The school closed in 1981 and reopened in 2013 as an event space. You’ll still find hallways full of lockers and concerts are held in the original school auditorium. The rooftop space is definitely a highlight of this venue. Uninterrupted views of the Portland skyline as well as views of Mt. Hood to the East. 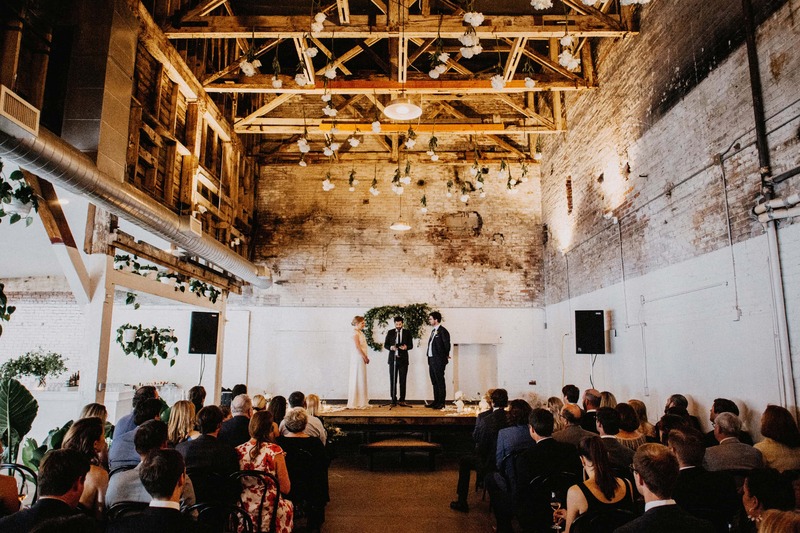 Yes, the Jacobsen Sea Salt brick and mortar is open for weddings. Their open floor plan, high ceilings, and exposed white brick create a beautiful backdrop and a space to get creative. The tasting room features an exposed beam ceiling all the way to the rafters. Great for small groups and option to extend the party outside with a tented parking lot. For this last indoor venue we are getting out of the city and into the woods! Silcox hut is located at Timberline Lodge at the base of Mt. Hood. Getting married in the winter months? This cozy stone hut is winter wonderland perfection. One of those rare occasions when you would kindly welcome a storm on your wedding day. The snowcat will even transport you and your guests from the main lodge to this little winter retreat. Let's say you want to keep it simple, you're having a small ceremony, or you want to spend more on what matters most to you. As I said before, Portland is a gorgeous place with a lot of natural beauty to offer. You can get married in public parks that look like your own private oasis. Or if you want to have a big party while staying on the budget there are plenty of options for this as well! 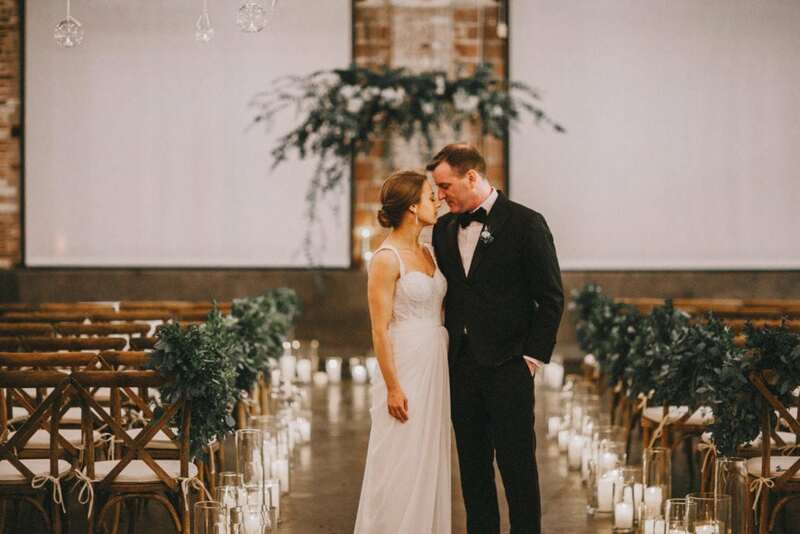 Here are my favorite inexpensive wedding venues in Portland. 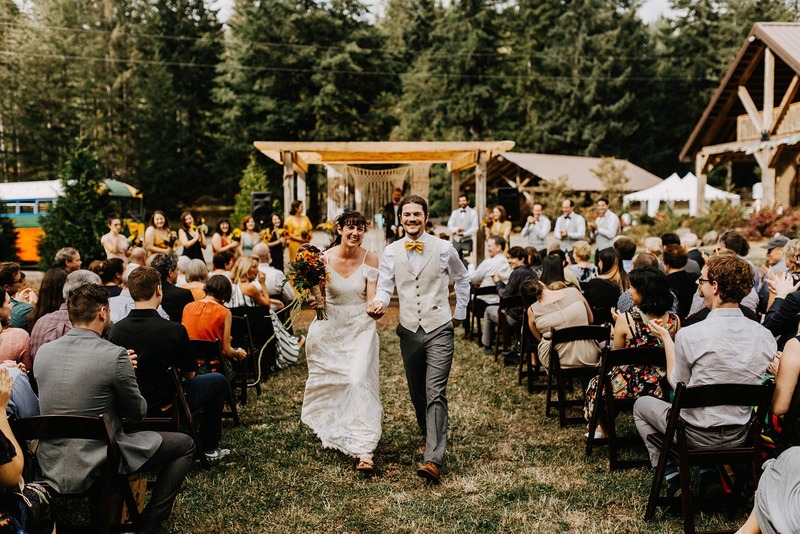 There are two lovely ceremony locations in Hoyt Arboretum. The wedding meadow and the Redwood Deck (about 100 yards apart!). The wedding meadow is a larger space with room for lots of chairs and guests. The Redwood deck is smaller but the most beautiful by far. The deck looks out to an expansive grove of giant Redwood trees and you’ll see local hikers pass by every few minutes getting a glimpse of the ceremony. This, in my opinion, is the best location for the very budget-friendly price of an event permit. I love Oregon state parks because they are accessible to everyone, the employees are awesome, and of course, they are some of the most beautiful places in the world. Silver Falls has several different lodges to host your celebrations and many lodging options for guests like small cabins and group lodging. There are plenty of activities for guests including a loop hike featuring TEN waterfalls. The St. John’s Bridge was constructed in 1931 and looks, well, like a cathedral. The bridge towers resemble a gothic cathedral architecture and the supporting beams underneath the bridge look like a church ceiling. The architecture of this bridge and the staircase leading to an amphitheater platform make this spot popular for weddings. You can find more information about permits and rules in the link below. Mt. Tabor is the Eastside’s equivalent to the West’s Forest Park. Mt. Tabor is an extinct volcano in SE Portland. There are miles of fern-lined trails and towering pines. 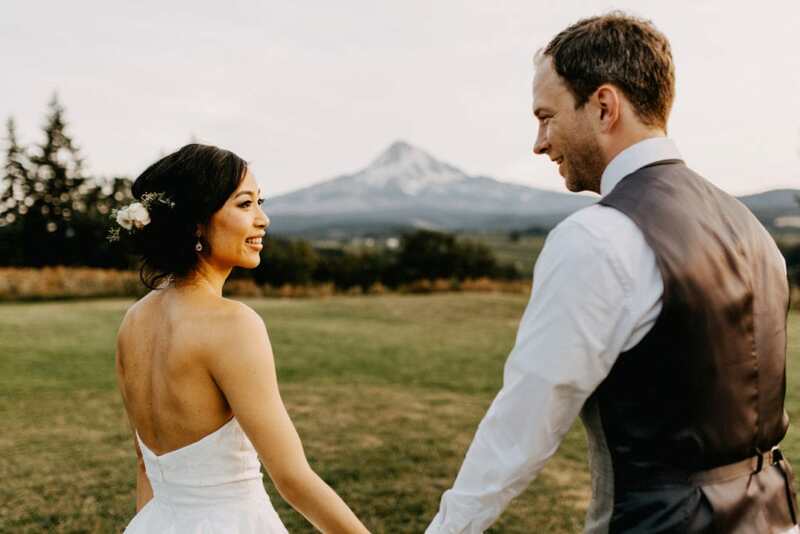 There are several ceremony locations including the summit where you can see downtown Portland and the entire of the city. Opal 28 is a small but cute, sophisticated venue in the Central Eastside Neighborhood. There is a cozy courtyard with an abundance of potted plants and a naturally bright dining room inside. The concrete patio is great for a ceremony and reception. Best for groups of 40 or less. For easy access to sweeping views of the Gorge, make your way out to the Cape Horn Overlook. A newly built viewing platform is just a quarter-mile hike from the parking lot. The amphitheater seating is perfect for a small group of loved ones to watch your vows and take in the view at the same time. No reservations here so be prepared to have a few “extra” guests. A one-mile hike from the parking lot just off of I-84 will lead you to one of the Gorge’s most scenic waterfalls. Wahclella Falls has long been a popular gem of the Columbia River Gorge. It is a popular wedding venue for small ceremonies and elopements. My advice; if you choose to tie the knot here, do it early in the morning before the crowds show up. In the morning this place is perfect, by noon it’s a little more than cozy. Located on Portland’s Sauvie’s Island is the modern architecture of the Croft Farm. Clean and sleek meets rustic farm life here. Sauvie’s Island is only 20 minutes from Portland, but like many venues outside of the city, it feels like you’re far from everywhere. There are many beaches on the island including a famous clothing optional beach if you’re feeling free. Sunsets out here are fantastic and kind of perfect for any low-key wedding. This little cabin in the woods is a lovingly cared for Airbnb with a property that ends where the Salmon River and Sandy River converge. Perfect for a small group of guests who want to spend the day relaxing by the river before a small ceremony in the woods next to the cabin. Cook dinner at the cabin and talk late into the night next to the campfire. Can you tell I have a favorite here? Guests can find lodging at nearby airbnbs or at one of the many lodges in the area. Located on the Long Beach Peninsula in Washington, the Sou’wester has a special place in my heart because it’s so unique! 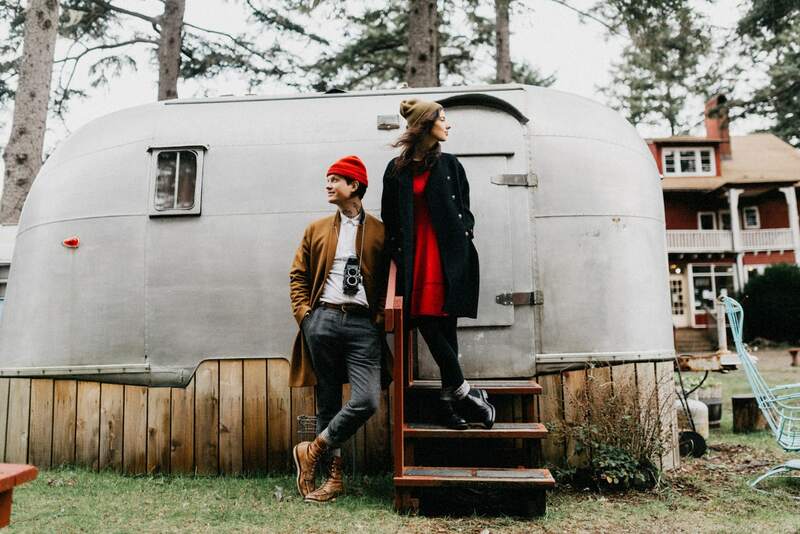 A property full of vintage travel trailers is available to reserve for your wedding guests. Get married right in the middle of it all. The lodge also offers guest accommodation in quaint rooms full of historic character. There are plenty of activities for everyone. The lodge is right next to the beach and Cape disappointment is only a 15-minute drive away. Yes, it’s a trip from Portland, but well worth it!